Several writers create a link between the college sports industry to the ancient slavery era described in the History books. The idea is that the slaves worked endlessly and all they got in return was room and board with occasional meals while their masters gained enormous wealth. While in college sports, the athletes are expected to perform to the best of their abilities with returns hiking up the tickets sales among other business ventures for The National Collegiate Athletic Association (NCAA) and its other investors. To some this might be a harsh comparison while to others it is just a form of modern day slavery. The world of college sports can be described as a multi-billion dollar industry. Over a given year, the industry generates approximately $11 billion (Edelman). The National Collegiate Athletic Association (NCAA), which is the governing body for student-athletes in North America is the beneficiary from these funds. This revenue is shared among other businesses but the sole contributor, the athletes, are completely left out. Some may say that student athletes are slightly compensated with being awarded with academic scholarships. However, student athletes should be paid for their efforts. According to the NCAA’s laws, upon being a student athlete, the athlete must be an amateur and maintain amateur-ship. In being an amateur, the athlete must refrain from accepting monetary funds for their efforts, refrain from professional contracts as well as playing with professional teams or attending professional teams tryouts. They may receive only educational benefits (i.e., room, board, tuition, fees, and books) (“Amateurism”). Student athletes should be paid for their efforts because the NCAA along with other organizations profit heavily off their talents. Also, these athletes are recruited to play their hearts out and after a long college career it is possible that injuries will occur and this could pose a financial strain on their pockets. Finally, most of these athletes are recruited for their mere talents and not academic skills, so why not pay them for their talents? In an article written by Law Professor and Sports Business Expert, Marc Edelman, he clearly states the large profits that are gained by the NCAA from these athletes’ talent. “Fifty colleges report annual revenues that exceed $50 million. Meanwhile, five colleges report annual revenues that exceed $100 million. These revenues come from numerous sources, including ticket sales, sponsorship rights, and the sale of broadcast rights. The National Collegiate Athletic Association recently sold broadcast rights to its annual men’s basketball tournament for upwards of $770 million per season” (Edelman). Where does this money go? Well, this is shared between NCAA executives, athletic directors and coaches in the form of salaries. In one year alone, the NCAA’s president, Mark Emmert, was paid $1.7 million. A head coach for a star team can be paid approximately 160 times more than the average public school teacher (Edelman). The NCAA has released several documents explaining that the venture of paying athletes will become an expensive one on the part of the institutions. Yes, it is understood that it will be an expensive venture for the institutions but what about the NCAA? The schools are responsible for getting the best programs, the best coaches they can afford and also the best athletes they can recruit to build their sports programs, but who is responsible for the athletes? Isn’t the NCAA their governing body? Being the governing body, it is their responsibility to ensure that their athletes are well taken care of. In a sense they can be then seen as the government for these athletes. Initially, the foreground for the organization was to ensure that these student athletes were not taken advantage of by the budding business community, but today, they seem to have forgotten everything about what they’re standing for. They don’t support or stand tall for these athletes. Instead they are the same thing they were protecting the athletes from. Researchers have shown time and time again that college athletes are prone to injuries after leaving college. It is also proven that most of these athletes won’t make it to the big time or become professionals. So without making it in the professional arena, carrying or having new injuries due to college incidents can pose a strain on the pockets of these young athletes. The NCAA started a good initiative by requiring all universities and colleges to ensure their athletes are insured before competing. However, the association never made the standards clear for what the insurance coverage should entail when this rule came into place. The decision was now completely left in the hands of the colleges to decide for themselves. Some colleges did good with this rule while others not so well. This later led to massive confusion between the athletes, their families and the institutions (Peterson). If these athletes were properly compensated or paid for their efforts in college, then they would have had money at the end of college. If the athletes got paid and blew this money out, then it would be fair to say that the NCAA did their job and effectively. In that case the athlete is expected to blamed and blamed solely. The NCAA’s regulation is only responsible for them during their college career. Is it fair for the parents to allow their children to be “used” and at the end they are left with the expensive medical bills in the end? These athletes devote their entire college lives to either studying, competitions, the gym or training. So there is basically no time for themselves. Athletes aren’t looking to made overnight millionaires but to be properly compensated for their efforts. If these athletes were not set on these tight held schedules, then time would be available for part time jobs which would then help to provide some level of financial independence. However, the athletes’ main job after academics is to solely do well in their sporting area. Student athletes spend at least 60 hours a week practicing which leaves little time for studying. Sometimes most of these athletes are not properly prepared for college. A study published by CNN in 2014 clearly showed that approximately 7%-18% of student athletes can only read at an elementary school level (“Compensation for College Athletes”). It is evident that these student athletes will not be able to cope at the university level which leaves their sole purpose as their talent. Therefore, they should be paid for their talents. Advocates for student athletes not being paid will firmly say this will discredit them from being an average student or them being more privileged than the average student. However, the opportunity for being a regular student went out the window a long time ago. Colleges and universities all over the USA have stern GPA and academic regulations for one to be accepted. But being an exceptional student athlete can allow this rule to be amended for you. If a college is making this clear distinction within their cohort, it is only fair to say it is then OK for them to pay these athletes. The quality time spent in the gym or training is equivalent to most working adults’ time card at work. This time has no regards to the time spent in class. All play and no pay is the game student athletes are involved in. Yes, they are compensated with a scholarship which covers education cost. What happens when an athlete like Jason Whitehead stumbles upon a roadblock during his college career? He/she is left out there in the cold while their talents have provided millions of dollars to the pockets of the NCAA and other business partners. Student athletes should be paid for their efforts; it is utterly unfair that their talents are only paying NCAA and other investors but not themselves. “Amateurism.” National Collegiate Athletic Association. NCAA.org. N.p., 24 Apr. 2014. Web. 11 Oct. 2016. “Compensation for College Athletes.” Opposing Viewpoints Online Collection. Detroit: Gale, 2016. Opposing Viewpoints in Context. Web. 4 Oct. 2016. Edelman, Marc. 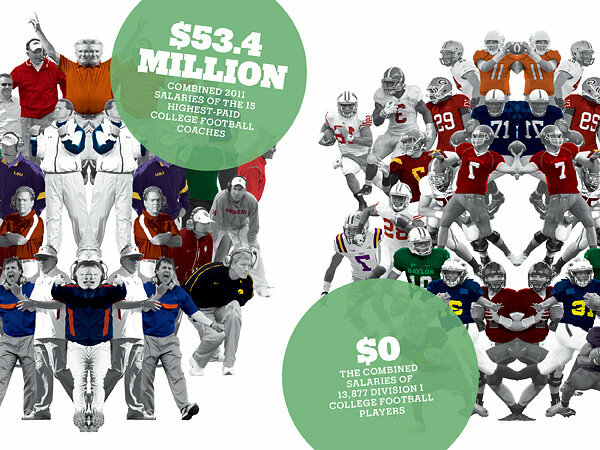 “Should College Student-Athletes Be Paid?” U.S. News Digital Weekly 5.52 (2013): 17. Academic Search Premier. Web. 4 Oct. 2016. Peterson, Kristina. “After Injuries, College Athletes Are Often Left to Pay the Bills.” New York Times. 16 July 2009: A1(L). Opposing Viewpoints in Context. Web. 23 Oct. 2016.